Individual-sized Pu-erh tea tiramisu made with layers of sponge cake brushed with a bold and earthy tea soak, alternated with layers of silky smooth mascarpone cream. This Pu-erh tea tiramisu recipe is part two of this month’s series on baking with tea, in collaboration with my friend Daniela from Tea Cachai. In case you missed it, we shared a recipe for these lovely lavender & Earl Grey scones last week. I was so glad to hear from many of you that we aren’t alone in being big fans of Earl Grey tea (especially when paired with lavender)! Today’s recipe uses Pu-erh tea, which Daniela actually introduced me to for the first time. When Daniela and I started brainstorming different ideas for baked goods made with tea, I already had two other recipes on my mind. First, I had recently been considering making a tiramisu-inspired layer cake, just for fun. And second, I’d just finished baking my copycat Milk Bar birthday cake for a friend’s birthday. This tea tiramisu recipe is their very obvious brainchild! Daniela was excited about the idea too, and suggested we use Pu-erh tea because of it’s bold, earthy flavor that would complement the cocoa and mascarpone well. I’d never heard of Pu-erh before, but Daniela is a tea sommelier, so I decided to trust her, and I’m so glad I did! 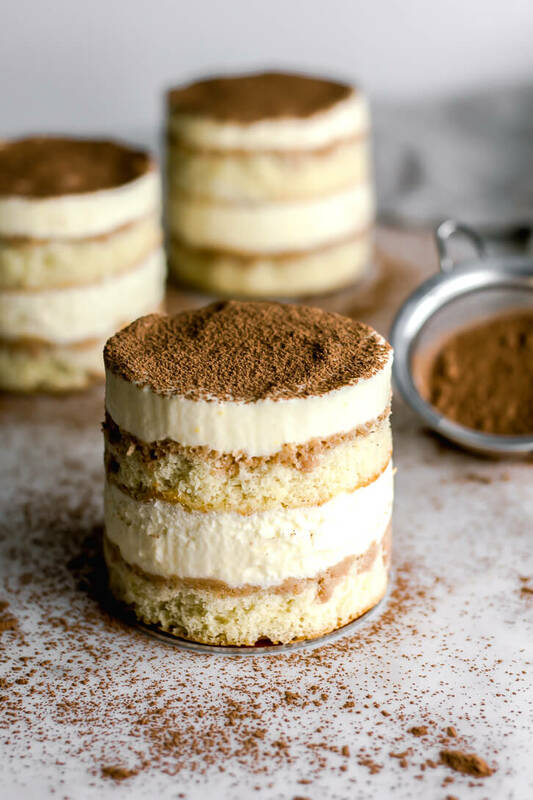 If you’re familiar with the traditional version of tiramisu, each element of this tea tiramisu recipe will be quite familiar, but we took a few liberties. Obviously, we swapped out espresso for Pu-erh tea, but we also replaced the traditional ladyfingers for a homemade sponge cake. Sponge cake gets it’s rise from whipping the eggs and sugar until the mixture increases significantly in volume. It’s simple, airy, and not overly sweet. Which makes it the perfect thing for soaking up the tea flavor. For tea tiramisu, you’ll want to brew your tea significantly stronger than you would if you were planning on drinking it. We brushed the tea onto the cake with a pastry brush and we suggest generously soaking the cake to get more of the tea flavor. We used every last drop of tea between the eight layers of sponge in these mini tiramisus! Four wide-mouth mason jar lids and bands – I discovered you can buy the lids/bands on their own, which was super convenient for the sake of this recipe. This will form the base in which you build the individual tiramisus. A circular cutter – the same size or just barely smaller in diameter than your mason jar lids for punching out the cake layers (see recipe notes if you don’t have one on hand). A roll of clear acetate – these plastic strips are perfect for creating rings in which to build layered desserts. Lining the inner edge of the mason jar bands with acetate will create a cake ring 3-4 inches tall in which to build the tiramisu. Tape – for creating the acetate ring, most any tape should do! Pu-erh Tea – Daniela and I loved how this Emeperor’s Pu-erh Tea complemented the flavors in this tiramisu. If you’re really not interested, you could use another favorite tea flavor (should be something bold and strong), or you could even go the traditional route and use espresso. A metal sieve – for dusting cocoa powder on top of the tiramisu. You’ll want to let the tiramisu set for a while in the fridge before serving, so don’t forget to plan ahead! This allows the tea to soak in a bit more, and also gives the cream time to firm up. This recipe can definitely be made a day or so in advance, just make sure to leave the acetate on until you’re about ready to serve them so that the sponge doesn’t dry out at all. If you make this recipe, let us know! You can leave a comment below, and you can also connect with us over on Instagram @flourcoveredapron and @teacachai, we’d love to get to know you! Preheat oven to 350 degrees Fahrenheit and line a 10x15 inch jelly roll pan with parchment paper. Spray generously with non-stick cooking spray. In the bowl of a stand mixer, beat the eggs and sugar on high speed until thick, fluffy and tripled in volume (about 7-10 minutes). Turn mixer off and gradually add the cake flour, folding it gently with a spatula and keeping as much air in the batter as possible. Add salt, vanilla, and melted butter and continue folding until incorporated. Make sure to scrape the bottom of the bowl to get any lingering pockets of flour. Pour into the prepared pan and bake for 18-20 minutes, until toothpick inserted into the center comes out clean. Let the cake cool in the pan for 5-10 minutes, then turn out onto a wire rack to cool completely. Put the bowl of your stand mixer in the freezer so that it's as cold as possible for the whipped cream. Meanwhile, place the egg yolks and sugar in the top portion of a double boiler over simmering water. Whisk frequently until the mixture is pale, smooth, and doubled in volume. Remove the pan from heat and whisk in the mascarpone cheese. Set aside. Remove the mixing bowl from the freezer and add the heavy whipping cream. Beat on high speed just until stiff peaks form. Fold the whipping cream into the egg yolk and mascarpone mixture until fully incorporated. Chill until ready to use. Over low heat, bring the milk to a simmer in a small saucepan. Once the milk is heated through, remove from heat and steep with the three bags of tea for about 10 minutes. You'll want a strong brew! Once steeped, dispose of the tea bags. Transfer the sponge cake to a large cutting board and use a circular cutter** to punch out 8 circles of sponge cake. Place four mason jar lids/bands face up on your countertop and use a strip of acetate to create a ring that will fit just inside the band of your mason jar lid. Tape it together so that it stays in place. This should create a cake ring 3-4 inches tall in which you can build your tiramisu. The lid of the mason jar will act as a base to make it easier to transfer your tiramisu to a plate later. For each tiramisu, start by placing a layer of sponge cake inside the ring and pushing it down to the bottom. Using a pastry brush, generously soak each sponge with the pu-erh tea soak. You'll want to use half the tea soak among the first four layers of tiramisu. Next, place a few spoonfuls of mascarpone cream on top of each sponge and spread it out evenly using the back of a small spoon. Top with another layer of sponge, pressing gently until the cake and the cream below are both level. Then, brush each cake with the remaining tea soak, dividing it evenly among the four tiramisus. Finally, top with another layer of mascarpone cream and smooth it out evenly. If desired, make sure to set aside a few tablespoons of cream for piping on top at the end. Place tiramisus on a baking sheet in order to transfer them to the fridge and chill for a minimum of 2 hours. to allow the cream to set. Just before serving, remove the tiramisus from the fridge and use a metal sieve to dust the tops with cocoa powder. If desired, use a piping bag and a large, closed star tip to pipe swirls or stars on top of each tiramisu. Pop the tiramisus out of the bands (leaving the lid on the bottom) and gently peel off the acetate to serve. *Can substitute 1 cup + 2 tablespoons of all-purpose flour mixed with 2 tablespoons of cornstarch, sifted for cake flour. **You'll want a circular cutter the same diameter, or just barely smaller, than your mason jar lids. In a pinch, I've used a sturdy drinking glass (carefully) to do this, or you can trace around the mason jar lid (just the flat circular part) with a sharp knife if nothing else. This looks so dang good! Seriously! I want this for breakfast this morning.